Welcome. By clicking on this website you have opened a window into the never-before-seen life stories and dreams of hundreds of refugee youth from Burma, also known as Myanmar. For over 50 years, Burma was one of the most isolated and oppressed nations in the world. In 2011, the country’s military junta ceded power to a quasi-civilian government that has begun to implement democratic reforms. Yet beyond the media spotlight, human rights abuses have continued, especially in resource-rich ethnic regions of the country. 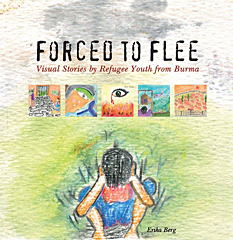 This site was created to help empower you – a (potential) reader of the book, Forced to Flee: Visual Stories by Refugee Youth from Burma – to increase awareness of and mobilize support for those who have been forced to flee violent conflict and persecution in Burma.